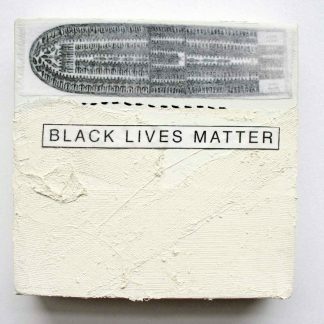 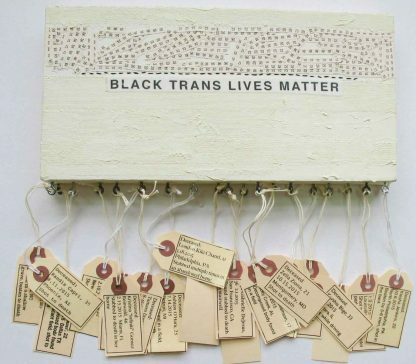 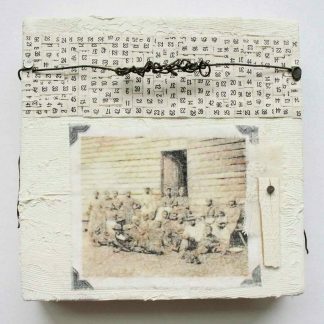 acrylic, fabric strips, transfer on fabric (words “BLACK TRANS LIVES MATTER”), numbered tape, metal eyelets, twenty 2½” x 1¼” paper tags* with string, tape transfers of printed text, hand stitching, embroidery floss. 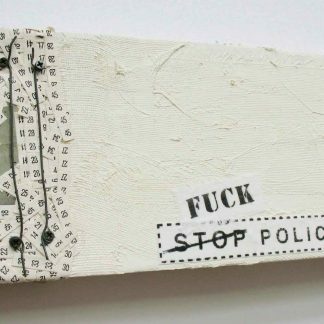 *each records a transgender person’s death: name, age, date of death, city, town, manner of death. Please Note: The impetus for this piece was the courtgeous direct action of Black Lives Matter activists who stopped the 2015 Boston Gay Pride march for 14 minutes to bring attention to the loss of 14 transgender people of color who had died so far that year.